Have You Ever Taken A Class Online??? It seems one of the newest (and for me the best) way to take a class is online. The education you can gain from online classes is remarkable now! I’ve taken many classes, mostly to learn about business. But now I’m going for more fun pursuits. My latest class is for an art app on my iPad called Procreate. I love to paint, especially abstracts. I still like laying down the canvas on the floor in my art room in case I spill something, getting a new white art canvas out and then selecting my paint colors. Most of the time I just see what flows from the brush to the canvas with no particular direction in mind. Except the more colorful the better! But I like to be able to create on the go. Even with my writing, I love going to the beach with my laptop, find a table and just let my thoughts flow. Now I’m learning how to create digital art. I can create new art pieces without bringing paints, paper/canvas, water, etc., with me. And I really like it! The range of styles and things you can do with digital art is amazing! You can even buy different digital brushes to enhance your paintings. I love learning this new art form and it is another way for me to take a break from writing when I just need to clear my head. Another skill I’m learning online right now is how to make handmade jewelry. As I master one technique I look to another and again, I’m having so much fun. The internet classroom is full of so many possibilities. Have you taken a class online? If you haven’t I would highly encourage it. Find something you are interested in and I’m positive there is a class out there waiting just for you. 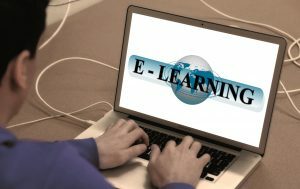 Online Learning Offers Unlimited Possibilities!